St Mary's in Hamstead Marshall first appears in the records as a field church (distinct from a chapel by virtue of having its own burial ground) reporting to the mother church at Kintbury. However, it's likely that worship took place on this spot many centuries earlier. 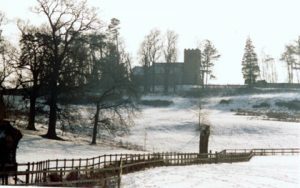 The late Rev Richard Jeans believed that the present-day burial ground was superimposed on a Saxon predecessor. The Saxon village of Hamstead has been located close by and, like so many English churchyards, St Mary's has an ancient yew, thought by some to indicate a place of pre-Christian worship. 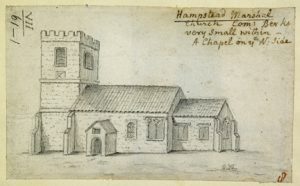 In 1241 Hamstead church gained parish status and its first rector, Hugh of St Theodoric. 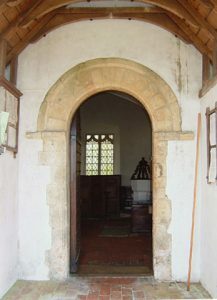 The arched doorway inside the Victorian porch dates from the end of the twelfth century, around the time when William the Earl Marshal of England became lord of the manor. Edward III visited here in the mid-14th century, and would have entered through this doorway. The north aisle was added around 1350, when many local churches were benefiting from prosperity in the wool trade. However by 1393 the church had fallen into disrepair, and the incumbent was threatened with a 20-shilling fine if he failed to put matters right by Michaelmas. The tower was built in the 1620s, although it has sometimes been mistaken for later work. It probably replaced an earlier tower, because one of the two bells which hang today is dated 1592. The pulpit, font, communion rail and box pews also date from this period. 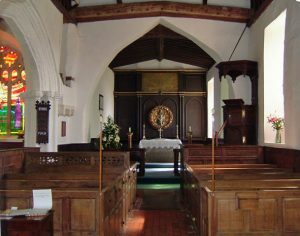 The west gallery and reredos were added later. Viewed from outside, the east wall of the main aisle shows clear evidence of a window long since filled in with flint, brick, mortar and rubble. It appears glazed in a sketch of 1780. The straight-headed windows of the nave and chancel are thought to be early sixteenth-century. A major refurbishment took place in 1893, when the present porch was built, though the church is considered to have been relatively unspoilt by Victorian renovation. More restoration in 1929 by Sir Charles Nicholson revealed a long-lost ten-foot square vault in the nave. It contained the remains of Balthazar Gerbier, the architect of the first Lord Craven's manor house, and Gideon Hicks, the earl's blacksmith. 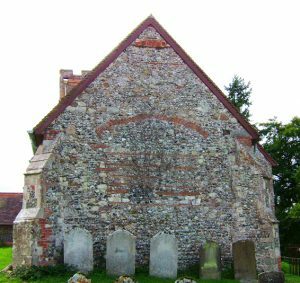 The restoration work also found an Early English chancel arch, and the tombstone of Richard Smyth, who died in 1629 leaving money for the poor of the parish and for a sermon to be preached each Whitsun. At this time the gold-lettering on the reredos (the Lord's Prayer, Creed and Ten Commandments) was painted over. 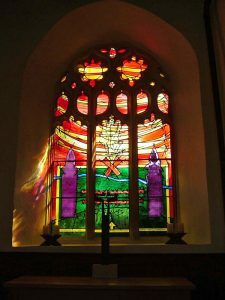 The most recent addition to the church's ornament is a stained glass window, commissioned to commemorate the millennium. The artist was Mark Angus, whose work incorporated visual references to local topography and history. The window was installed into the medieval stonework of the east-facing windows of the north aisle, where it is splendidly illuminated by the morning sun.